On Wednesday, January 23, 2019, at approximately 7:15 PM, Officers with the Colorado Springs Police Department(CSPD) responded to a call of multiple shots fired in the 2500 block of Verde Drive. When officers arrived on scene they encountered an armed suspect and shots were fired. The suspect was transported to a local hospital where he was treated for non-life-threatening injuries and released to law enforcement. 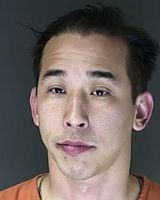 The officers were uninjured and have been placed on routine administrative leave in accordance with CSPD policy. There is no current threat to the community regarding this incident. The suspect has been identified as Thomas McGeorge, DOB: 10/18/86. He has been booked into the Criminal Justice Center on the charges of Felony Menacing (2 counts), 3rd Degree Assault, Prohibited Use of a Weapon and Reckless Endangerment and is being held on $100,000 bond. In accordance with Colorado Revised Statute 16-2.5-301, the El Paso County Sheriff’s Office is the lead investigative agency for this officer involved shooting. This is an ongoing investigation and information will be released as the investigation allows. A mug shot of McGeorge is attached to this media release.